The Lycèe Trading Card Game logo. The Lycèe Trading Card Game is a Japanese collectible card game developed by Silver Blitz and published by Broccoli that uses characters from a variety of (mostly) visual novel computer games. Lycée is a French word roughly meaning 'high school'. Most of the cards are given unique, fanmade artwork. The object of the game is to get one's opponent's sixty card deck down to zero, which is mostly done by attacking with character cards. There are five rarities of cards: common, uncommon, rare, promotional, and lucky. The 'lucky' cards are the most valuable, and may sold for as much as 9,800 yen on Japanese secondary markets. By contrast, 'rare' cards sell for between 50 to 1200 yen. There are four different card 'types': character, event, item, and area. In addition, each card is one of five 'elements': snow (雪 yuki), moon (月 tsuki), flower (花 hana), void (宙 sora), and sun (日 hi). There are also elementless (無 mu) cards that are symbolized by a star . Elementless cards can only pay for other elementless cards, but any element can pay for an elementless' cost. Cards are played by discarding other cards from one's own hand to pay for a card's cost. 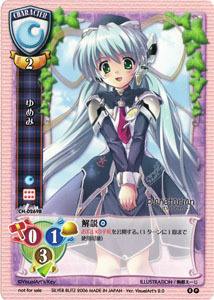 For example: the Yumemi card pictured is worth if she is discarded ( is her type as shown in the upper-left corner and her worth, 2, is directly below her type) and costs to be played (the cost is shown over the field limitation icon, the six red dots on the left hand side). Promo character card of Yumemi from Planetarian: The Reverie of a Little Planet. While most cards are given original, fanmade artwork, this card uses the official artwork due to being a promotional card.